Clay in soil can be a gardener's nightmare. 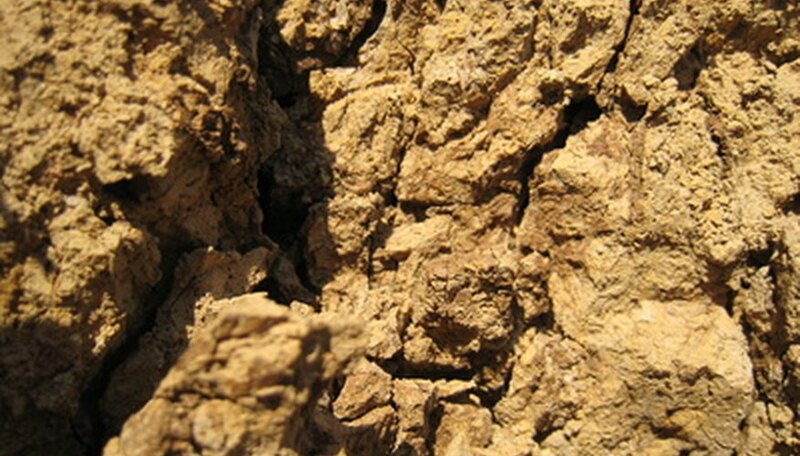 With a tendency to compact, clay will often impede or stunt root growth. Highly alkaline (high in pH), clay is hard on plants and even harder on a gardener's back as it is heavy, sticky and often difficult to work. Fortunately, there is an organic, non-toxic and inexpensive solution--gypsum. A natural mineral, gypsum is known as hydrous calcium sulfate or selenite and is aggressively mined in Iowa, Oklahoma, Texas, Nevada and California. A popular product for the construction industry, gypsum is used in wallboard (sheetrock). As an ingredient, it can be found in chalk, plaster of Paris and Portland cement. Its ability to break up compacted soils has made it an important product in commercial agriculture, lawn care and backyard gardens. Although nontoxic and inexpensive, gypsum is quite controversial. Linda Chalker-Scott, Ph.D., an associate professor at Washington State University, is one of many voices that caution against the notion of gypsum as a magic bullet that will green up your garden overnight. She points out that urban soils are mixtures of both native and non-native topsoils, as well as additives, and are inherently soft. Adding in gypsum will have little to no effect unless you need more calcium. However, on the subject of clay, Chalker-Scott agrees, "one can see improvement in clay soil structure and fertility by using gypsum." Pure gypsum is not a fertilizer as it contains no plant nutrients. Gardeners do not need to worry about burning a lawn or garden and little damage can arise from an over-application. Usable year-round, the mineral can be applied in hot or cold weather, and since it is nontoxic, children and pets can play on the lawn or near the garden after application. A natural product, gypsum is organic. Gypsum for gardens is typically available in a granular form. If applying the mineral to a lawn, use a broadcast or drop spreader and calculate your spread at 40 lbs. per 1,000 feet. Once spread, water immediately, giving the lawn a good, deep soak. The gypsum should dissolve in the initial soaking, but depending on the hardness of your water, it may take a few cycles. No further applications are needed for at least a year. For a flower or vegetable garden, hand distribute the mineral by scooping the grains in a loose grip then flicking them evenly across the garden as if dealing playing cards. Water immediately. Gypsum is slow-acting and can take up to three years to show significant results. Determine how intense your clay problem is before investing time and money in gypsum. The product is only useful on hard soils found in the Southwest and along coastlines or occasional pockets of clay found in all 50 states. The grounds around new homes are often compacted by heavy machinery and may profit from a gypsum application. Gypsum causes clay to break down into small particles via a chemical process in which the calcium in the gypsum competes with the salts in the clay, drawing soil particles together and causing the clay to loosen.